A big hello to all of you Capturing Joy readers! 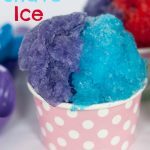 I’m Debbie, one of the three sisters who blog over at Made From Pinterest and I’m so excited to be here today to share this super fun recipe for Jello Shave Ice to help cool your summer down! Is shave ice popular where you live? Here in Utah, you can barely turn a corner without a shave ice hut on it. The other day I counted over 40 people in line at the shave ice hut near my home. It’s a crazy phenomena here. Now here’s a lesson for you on shave ice. If you know what you are talking about, you will call it “shave ice” and not “shaved ice”. If you call it “shave ice”, it means that you know thats it’s official Hawaiian name. If you call it “shaved ice”, you are showing your haole (non-islander) ignorance! My daughter is half Tongan and her husband is full Samoan so around our house, we definitely call it “shave ice”!! Now that you know what to call it, let’s get around to making it. Here we go! 2-3 drops of Americolor Soft Gel Paste in red blue and purple. Can also use regular food dye color. With a whisk, mix the dry jello powder into 2 cups boiling water. Mix well so that all the jello powder is dissolved. Add four cups of Sprite. Mixture will get foamy but that is normal. Add desired number of drops of food color. This is just to get a brighter color of ice. Pour into 9x13 pan and freeze overnight. When ready to serve, scoop out of the pan with an ice cream scoop. If desired, you can top with some condensed milk. One 2 litre bottle of Sprite yields 10 cups which makes 2 1/2 recipes. Thanks so much Kristen for the chance to come and share at Capturing Joy today! We hope your readers come by Made From Pinterest real soon and say hi! Looking for some more “cool” desserts? Check these out!